In versions of Visual Micro since Sept 2013 clicking the yellow question mark ? icon on the toolbar, when a sketch is open, will select the project and display the project properties (tool window). How to open the project properties window? 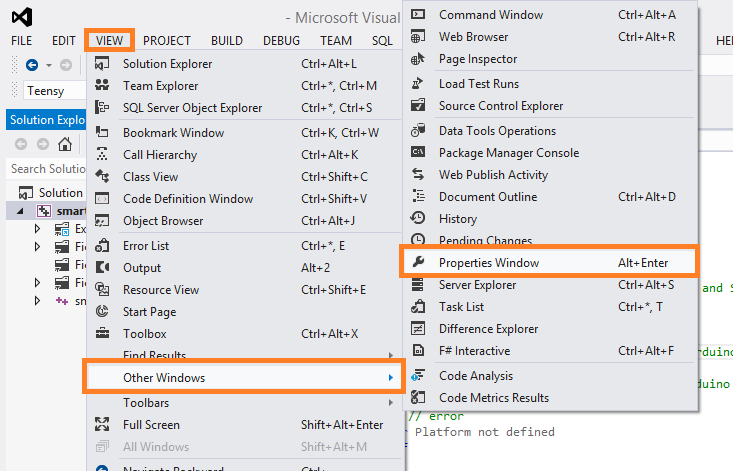 How to manually view the proeperties window for any Visual Studio item. note: Visual Micro only provides properties when a project is selected. note: If a project is not selected the properties window can still be seen but it will contain only a few standard Visual Studio properties so ignore. Click the project name in the solution explorer then click "View>Project Properties". In some instances of Visual Studio the properties are available on the "View>Other Windows" menu item (see below). Sometime the short cut key is F4 sometimes Ctrl+Enter.